Anthony will find a way to get along with new teammates this year. It’s not always easy to get along with everyone at the workplace. Now, just think about how difficult it would be if the office was constantly cycling in and out guys who were once employed by major competitors. Such is the life of NBA players, and thus, it’s not uncommon to find two teammates who have bad blood in their past. Apparently, that premise holds true for Carmelo Anthony and Sasha Vujacic. “We got into it a couple times,” Anthony said Sunday with a smile. “He was just one of them little dirty players, sneaky, grab your jersey, foul you after the play. He was speaking in his language, and I couldn’t [understand him]. Now I understand what he was saying to me. It made me hate him even more back then. 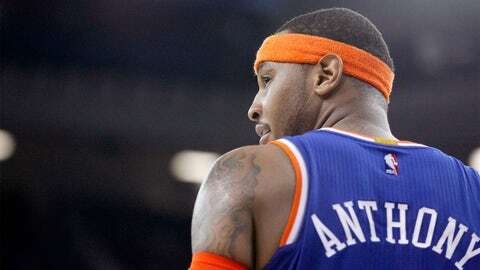 Melo has been pretty open this offseason about his personal feelings on the Knicks’ free agent signings. There was also the Robin Lopez admission earlier this year.